There’s no topic better suited to comedy than abortion — at least that’s the pro-choice premise Gillian Robespierre’s debut feature Obvious Child operates on. 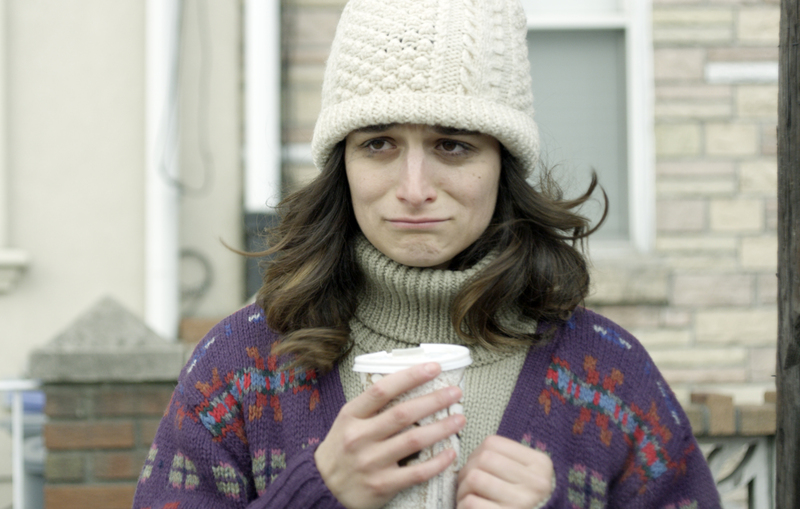 When struggling comedienne Donna Stern (Jenny Slate) gets dumped by her boyfriend, she does what any less-than-well-adjusted twenty something woman would do: gets trashed in Brooklyn with her gay best friend and goes home with the first straight guy she meets. But in her inebriated haze, she’s a little lax about the latex. “I remember seeing a condom…” Donna tells gal pal Nellie (Gabby Hoffman) in a panic a few weeks later, “I just don’t remember what it did.” The set up is similar to 2007’s fraternal twin pictures Juno and Knocked Up, except this time, not only does the protagonist actually go through with the procedure, it provides her with her some of the best stand-up material of her career. Generating a great deal of buzz at Sundance for its subversive and scatological humor, it’s hard to tell if abortion in Obvious Child works as a political statement or simply a plot device. Befitting any good boy-meets-girl story, Donna’s almost-baby daddy, Max (Jake Lacy) is her polar opposite. Dressed in chinos and a freshly ironed button down shirt, he bears all the markings of someone with a “real” job and is thus a fish-out-water amongst the hip artist types swilling beer at the Williamsburg bar where he and Donna first meet. Stealthily escaping from his apartment before he wakes the morning after, Donna is shocked when Max shows up at the second hand bookstore that (barely) employs her a few days later. As their paths continue to cross, both accidentally and on purpose, Max is increasingly charmed by Donna’s verbal diarrhea, and she by the fact that he’s just so damned nice. What stands out about Obvious Child is the way it downplays the emotional upheaval presumed to be a byproduct of such a big decision in a woman’s life. “You killed it” Hoffman’s character compliments Donna after a gutsy routine onstage. “Isn’t that what I’m doing tomorrow?” Donna quips nonchalantly. This isn’t to say the film is utterly devoid of feeling — it has its fair share of tender moments — it’s just that “the big decision” is shown to be not really a decision at all. While men get to sow their wild oats, biology demands women reap them and cinematic depictions of abortion and pregnancy, particularly those written and directed by men, tend to project all kinds of emotional turmoil onto the female mind and body. Even if Donna seems emotionally weak when it comes to her break-up, slinking outside her ex’s apartment she’s resilient through the pregnancy and its aftermath. Obvious Child is refreshingly free of weepy monologues, righteous speeches, and moral guilt-trips — there are no pro-life protestors waiting outside the clinic to inform Donna that her fetus already has fingernails in the hopes of changing her mind. There’s one particularly poignant scene in Obvious Child when Donna crawls into bed with her mother (Polly Draper) and finally admits that she’s pregnant. Expecting criticism — her mother seems to disapprove of most of what her daughter does — she’s instead met with sympathy and empathy. As it turns out, mom had a pregnancy terminated in her youth long before meeting dad, and as she recounts the experience of a slightly sketchy procedure at some clandestine clinic, it suddenly becomes evident just how far reproductive rights have progressed. The film’s openly comedic — and realistic — treatment of the subject is something no distributor would’ve touched with a ten foot pole in her mother’s day, but just a few weeks ago it was scooped up by A24. Perhaps the real political statement of Obvious Child is that its politics can be taken for granted in favor of the romance and one-liners that occupy its surface.